Bandas play a wide variety of songs, including rancheras, corridos, cumbias, baladas, and boleros. The history of banda music in Mexico dates from the middle of the 19th century with the arrival of piston metal instruments, when the communities tried to imitate the military bands. The first bands were formed in Southern and Central Mexico. In each village of the different territories there are certain types of wind bands, whether traditional, private or municipal. There are brass instruments in the state of Oaxaca that date back to 1850's. The repertoire of the bands of Morelos, Guerrero, Oaxaca, Chiapas and Michoacán covered gustos, sones, vinuetes, funeral pieces, marches, danzones, valses, corridos, paso dobles, polkas, rancheras, alabanzas and foxes. The traditional bands that play Yucatecan jaranas use the following instruments: clarinet, tenor saxophone, baritone saxophone, trumpet, trombone, timpani, drum drum, bass drum, cymbals, güiro. The traditional Oaxacan bands use a large number of saxophones and clarinets, fewer trumpets and slide trombones, and the bass drum and cymbals are played separately. One of the oldest bands recorded in Mexico is the Banda de Tlayacapan of the state of Morelos that was founded approximately in 1870, being one of the first to play la danza del Chinelo. The traditional Zacatecan tamborazo band does not use tuba, being the tambora the instrument that takes the low tone. Bandas play a large variety of genres, most commonly Rancheras, Polkas, Corridos, among others. Modern Bandas, however, have turned to record romantic ballads, leaving polkas and other danceable genres behind. Perhaps the most popular song played by Bandas is "El Sinaloense" ("The Sinaloan"), a song written by Severiano Briseño in 1944. "El Sinaloense" has been recorded by hundreds of Bandas, in both vocal and instrumental versions. The song has become so popular that many Sinaloans consider it as their unofficial anthem. Other tunes that are commonly recorded by Bandas include "Arriba Pichátaro", "Juan Colorado", "El niño perdido", "Que me entierren con la banda", "Palo verde", among others. The history of banda music in Mexico dates from the middle of the 19th century with the arrival of piston metal instruments, when the communities tried to imitate the military bands. In each village of the different territories there are certain types of wind bands, whether traditional, private or municipal. 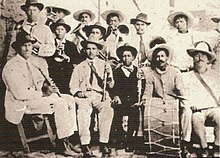 Banda music was established in the 1880s in the state of Sinaloa, Mexico, when it exploded into popularity in the 1890s throughout Mexico. Its roots come from the overlapping of Mexican music with German polka music. At the time, many German Mexicans lived in the states of Sinaloa, Chihuahua, Jalisco and Nuevo León. This greatly influenced northern Mexican music. Immigrants from northern Mexico brought the music to the United States. Initially popular in the southwest United States, primarily in Texas, California and Arizona, banda has followed the movement of Mexican immigrants to the Midwest United States and the rest of the country. Mexicans who came in contact with Latin-based Jazz of Chicanos or Mexicans born and raised in the United States adopted jazz-like sounds in banda to further enrich the music type. Throughout the 20th century, Banda music was traditionally confined to the states of Sinaloa, Jalisco and Zacatecas, whereas Mariachi and other Regional Mexican genres enjoyed more popularity in the rest of the country. However, in the 1990s Banda music started to become popular throughout the country, eventually becoming the dominant Regional Mexican genre in the XXI century. La Arrolladora Banda El Limón in 2012. La Banda El Recodo, La Arrolladora Banda El Limón, La Original Banda El Limón, Banda Sinaloense MS De Sergio Lizarraga, La Septima Banda, Banda Cuisillos, Banda Jerez, Banda Los Recoditos and La Adictiva Banda San Jose De Mesillas are some of the most famous bandas. 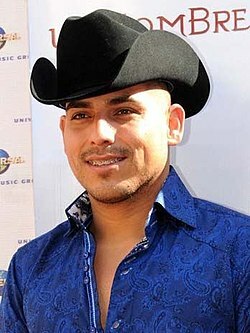 Famous soloists include Valentín Elizalde, Julio Preciado, Lupillo Rivera, Sergio Vega, Roberto Tapia, Espinoza Paz and Julión Álvarez. While not known primarily as a banda singer, Juan Gabriel also recorded in the genre. Despite banda being a male-dominated genre, there are a few female soloist banda-singers such as Graciela Beltran, Carmen Jara, Diana Reyes, Beatriz Adriana, Yolanda Pérez and Ninel Conde. Examples of females soloist who have recorded in the genre while not known mainly as banda singers include, Ana Gabriel, Alicia Villareal, and Ana Barbara. There's also a handful all-female bandas such as Banda Las Soñadoras and Banda Las Tapatias, both from Guadalajara, Jalisco. Jenni Rivera, the highest earning solo banda singer of all-time has been attributed to bringing a female perspective to what had historically been a male-dominated genre. Recently an upcoming solo artist has emerged by the name of Andrea Ferrera, she has shown to be successful selling out stadiums across both The United States and Mexico. The 2010s wave of popularity of the tuba in Southern California has been credited to its presence in banda music. As of 2017 El Salvador started having their own Banda music. Jenni Rivera, the highest-earning banda singer of all time. A typical banda is made up of brass, woodwind, and percussion instruments. The most notable instrument is the tambora which is a type of bass drum with a head made from animal hide, with a cymbal on top. Bandas were previously called "tamboras", named after this drum. The tambora is played in a strong and embellished manner, which provides the drive for the rest of the band. The percussion section also includes the tarola which is a snare with timbales which would resemble the tom-toms on a regular drumset, cowbells, and cymbals. Banda el Recodo, one of the most famous bandas, features three trumpets, four clarinets, three valve trombones or slide trombones, two E♭ alto horns, and one sousaphone. Like an orchestra, a banda can be organized into different sections. Bass: The lowest-pitched part is played by the sousaphone (referred to as a "tuba" in Mexico), accompanied by the tambora, a large bass drum with a cymbal on top. Harmony: Two Armonias, "charchetas" or "saxores" in Mexico (E♭ alto horns), play chords using different rhythms depending on the style. Tenor: valve trombones or slide trombones play the lower-pitched part of the melody/arrangement. Alto: Trumpets play the higher-pitched part of the melody/arrangement. Soprano: Clarinets and sometimes saxophones play as "singing" instruments that may play with the voice. Voice: Banda el Recodo and Banda Jerez consist of trios, but many bandas also consist of dual and solo singers. Most banda arrangements feature three-part harmony and melodic sections which contrast the timbres of the clarinet, trumpet, and valve trombone sections. Bandas play many different styles including waltzes, cumbias, polkas, marches, foxtrots, rock ballads, rancheras and sones. Historically bandas were village brass bands called on to entertain the town, and would play anything from opera overtures to big band jazz. This tradition continues today in many towns, especially during festivals and celebrations. Bandas usually have a strong percussion. The percussionists generally provide the accents and do not usually play all the time or keep a 'groove'. Often the percussionists will enter only when the singer is not singing, such as in an instrumental chorus. The groove is mostly provided by the sousaphone (or bass guitar in a few recordings) playing the bass line, and the alto horns playing sharp upbeats. Typically when a banda plays a cumbia, the alto horn players switch to Latin percussion instruments such as maracas, cowbell, congas, bongos and guiro. Bandas generally contain between 10 and 20 members. They usually have a lead singer and a second voice, and occasionally a third voice. The voice often consists of a duet, but solo singers and trios are also common. Besides the typical instrumentation, banda music, as well as many other forms of traditional Mexican music, is also noted for the grito mexicano, a yell that is done at musical interludes within a song, either by the musicians and/or the listening audience. In the late 1980s, a new subgenre of regional Mexican music was invented in the state of Nayarit called Technobanda. It is essentially a mix of traditional Banda with Grupero music. Its popularity spread to many nearby states as well as the United States. In this subgenre, some or all of the horns are replaced by electric instruments. A typical Technobanda will substitute a sousaphone with an electric bass and the two alto horns with a synthesizer and an electric guitar. The clarinets are frequently replaced with saxophones. Drums are also used. Technobanda popularized the dance-style of the Quebradita. In the early 1990s, another subgenre of regional Mexican music was created in the state of Michoacan called Tierra Caliente. Like Technobanda, it uses electric instruments like an electric bass and synthesizers, as well as trumpets, saxophones and drums. Some artists also use accordions. Tierra Caliente’s popularity was originally limited to the Calentano regions of Mexico, but it went on to gain popularity throughout many parts of the country, as well as in the United States. ^ "¿Quién escribio el Sinaloense?". Mazatleco. Retrieved 30 September 2018. ^ "AllMusic Review by Phil Freeman". ^ "The Death of an Independent Latina: Jenni Rivera (1969-2012)". Time. 10 December 2012. ^ Cobo, Leila (December 9, 2012). "Jenni Rivera, Big-Voiced Queen of Banda, Dead at 43". Billboard. Prometheus Global Media. Retrieved 4 April 2015. ^ Mejía, Iván. "Exposición 'Jenni Rivera, la Gran Señora'". Vivelohoy (in Spanish). Archived from the original on 2015-04-17. Retrieved 4 April 2015. ^ ""Tuba Raids" Plague Schools in California". ^ "Banda El Recodo banda member Aldo Sarabia murdered".